It was a point of contention that left a bitter taste in the mouths of the fans and the players alike, but the slump to the Medicine Hat Tigers is finally over. Brett Kemp scored a pair of goals just 2:02 apart and Andrei Pavlenko scored the game winner midway through the third period as the Edmonton Oil Kings (3-0-0-0) defeated the Tigers (1-2-0-0), 3-2, at Rogers Place on Wednesday night. 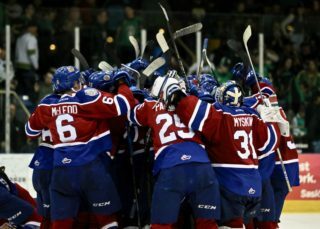 It was the first time in 20 regular season games that the Oil Kings skated to victory over the Tigers dating back to the 2014-15 season; February 22, 2015. It was also the first time since the 2014-15 season that Edmonton’s campaign has begun with an unblemished 3-0-0-0 record. Dylan Myskiw (2-0-0-0) earned his second win in an Oil Kings uniform after a busy night in goal which saw him turn aside 33 of 35 shots. 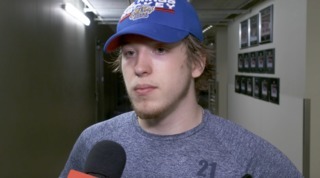 His Tigers’ counterpart Jordan Hollett (1-2-0-0) took the loss, allowing three goals on 33 shots as Medicine Hat outshot Edmonton 29-20 through the first two periods, but were outshot 13-6 by the Oil Kings in the final frame. The Tigers got on the board first when Bryan Lockner scored his second of the season – a power play goal – from Gary Haden and Ryan Chyzowski at the 10:46 mark of the first period. The play was initially whistled down as Myskiw appeared to make a stellar glove save along the goal line, but after a lengthy video review the call on the ice was overturned and Lockner was awarded the goal as the Tigers took a 1-0 lead. That was how the score would remain through 20 minutes of play as the Tigers outshot the Oil Kings, 12-10. 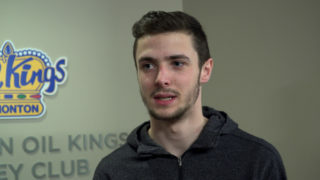 The Oil Kings first quality chances of the game came three minutes into the second period, as Jacson Alexander fired a shot in tight on Hollett followed by a Pavlenko rebound, but both were turned aside by the Ottawa Senators prospect in goal. Instead it was Medicine Hat who would double their lead, 2-0, as Eric Van Impe notched his first of the season with a shot that fooled the glove of Myskiw, from Henrik Rybinski and Elijah Brown, at 6:43. 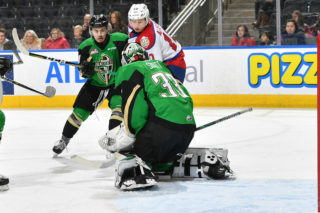 But the Oil Kings continued to press and, inside of five minutes to play in the third period, found themselves back in the game. 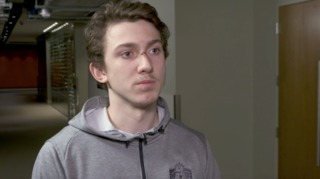 Kemp notched his first of the night, from Carter Souch, at 15:29 then struck again for his second of the game – and third of the season – just 2:02 later, assisted by Quinn Benjafield, at 17:31. 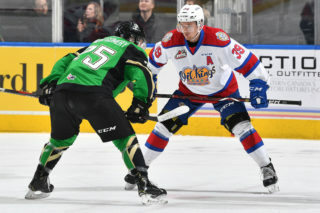 Pavlenko’s first goal of the season proved to be the game winner and came at 10:15 of the third, from Vladimir Alistrov and Matthew Robertson, to round out the game’s scoring and secure the 3-2 Oil Kings win. Medicine Hat finished the night going 1-for-4 on the power play while Edmonton was 0-for-1 on their lone opportunity with man advantage. Dylan Myskiw (EDM) (3), Ryan Jevne (MH) (2) and Brett Kemp (EDM) (1) were selected as the Three Stars of the Game. Wyatt McLeod, Matthew Robertson and Ethan Cap each wore an “A” and skated as alternates to captain Trey Fix-Wolansky. The Oil Kings are back in action Friday, September 28 when they host the Swift Current Broncos for a 7:00 PM (MT) start at Rogers Place. Great seats are still available for all Edmonton Oil Kings home games during the 2018-19 season starting at just $20. VisitOilKings.cafor more information or to purchase.